This brand for me is like no other, i had the pleasure of chatting with Laura who is the company's director to get a bit of background on this new brand. BM Beauty boasts that is is cruelty free beauty with attitude and that's no lie. I have taken this quote from the BM Beauty website "We're proud to say that our products have the stamp of approval from the BUAV and PETA. BM Beauty make up is also free from bismuth oxychloride, parabens, nano particles and synthetic dyes and fragrances." I got what you would class as a look taster kit, and these colours are from their story book collection. They are fun and flirty and can be worn a billion ways. 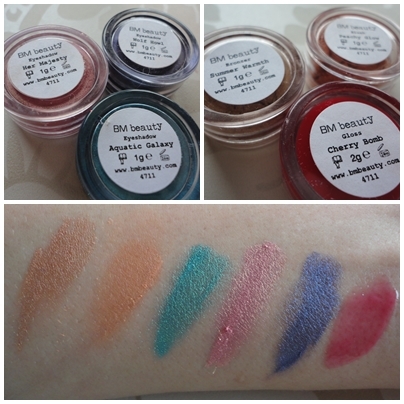 The application was good the colours are very Strong and pigmented, i found the best approach for application of the shadows is to pat it onto the eye before choosing to blend. Not only does this lower you chances of getting the powder ALL over your face but allows the colour to shine through more vibrant. The pots are a really good size and i don't see me getting to the bottom of them anytime soon. The bronzer is beautiful, it has a VERY light shimmer to me which suits me fine (not a great fan of too much shimmer). i applied it with my usual blush for a gorgeous pre-summer glow. Blusher - i have never worn a peach colour blusher before, but was pleasantly surprised how it looked good with the bronzer and in fact my skin tone (normally i stick to pinks being fairly new to the world of blush). Shadows - wow well what can i say the colours have swept me away i was a little nervous at first using colours which are quite so bold but i will use them again. Aquatic Galaxy is a stunning stunning mermaid green/blue, it has a subtly glimmer to it with a pearlesent hint. The gloss - a bold red in the pot, but when on the lips give a glass effect with a hint of colour. I cant wait to try and create new looks and i will defiantly buy more of the BM beauty products. Not only are they affordable but they are beautiful and cruelty free. Have you tried BM Beauty? How did you get on? Would you use them again? Great review my dear. These look like great products, I'd never heard of the brand before either but they sound and look good. I have to get myself to the Clothes Show this year!! What a fab range of colours! Those pigments are great!I've never heard of them either thanks for reviewing them.